Meet with Cameron Riopelle, PhD, Data Services Librarian at the University of Miami, or with Jorge Quintela, PhD, GIS & Data Specialist. Whether you are working on a paper, project, publication, or grant application, we are here to help! We are experienced in a variety of qualitative and quantitative methods (including survey research, statistical analysis, and archival research), and programs such as R, SAS, SPSS, NVivo, Stata, Tableau, and Atlas.ti. If the project is interdisciplinary and requires collaboration, we work closely with the Digital Humanities Librarian, GIS Librarian, and Research Data Scientist to work through issues and questions that may arise. If you are arranging a meeting about data analysis or research design, please include documentation. You can make an appointment for a consultation at our YouCanBook.Me page or through email. Learn software and languages such as SPSS, R/R Studio, SAS, NVivo, Atlas.ti, Tableau, Python, MPlus, LaTeX, Excel, REDCap, JASP, and Stata. 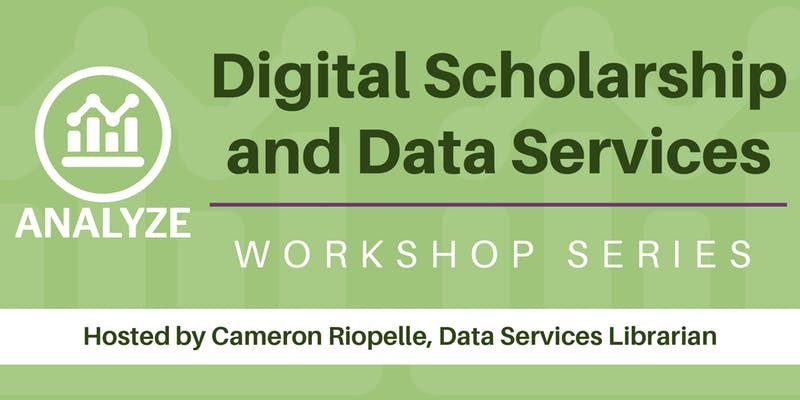 Learn methods for quantitative + qualitative research, data cleaning, and textual analysis/digital humanities. Access and download large datasets such as American Community Survey and the General Social Survey. Find data housed in data repositories, such as ICPSR. House data in data repositories. Choose the appropriate research design. Choose the appropriate method of analysis. Access to and use of data resources across disciplines. Meet specialist experts and subject specialists. Data Repository: The University of Miami institutional repository can be a home for your data as well as your research publications. DOI minting service: The University of Miami provides a DOI minting service for all of your publishing needs; both for your data and for other scholarly output such as article reprints, journal publishing, and other assets. Data Management Plan Review: You can ask for a review of your data management plan from the libraries, the writing center or the center for computational science. Sensitive Data Management: The Office of Research at the University of Miami provides several services to share data and meet HIPPA privacy and security compliance for researchers working with sensitive or private data. Online Survey Tools: If you plan to include an online survey in your research, please see the Qualtrics tool for use at the University of Miami. Contact our Research Data Scientist, Timothy Norris, PhD, for more information about these services. The Data Services team holds open walk-in office hours at the Richter Library, the Calder Medical Library, and the Rosenstiel School of Marine and Atmospheric Science (RSMAS) during the Fall and Spring semesters. Stop by and introduce yourself and ask questions! If you can't make the open hours, you can always schedule an appointment for a consultation at the Data Services YouCanBook.Me page or through email. The Digital Scholars' Lab at Richter Library has specialized research software including SPSS, SAS, R/RStudio, NVivo, and more! For more information, see Digital Scholars' Lab. The Data Services Workshop Series, offered each semester, covering introductory and intermediate sessions on the stats programs SAS, SPSS, and R/R Studio. Workshops are available upon request, as is documentation from each workshop.